Just a reminder it's that time again. In the US we "spring ahead" Daylight Saving Time begins at 2am Sunday morning. You will need to reset your board clock. Just a reminder it's that time again. In the US we "fall back." Daylight Saving Time begins at 2am Sunday morning November 1st. 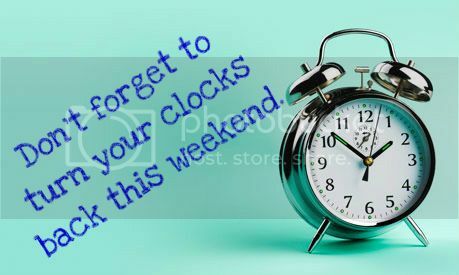 So you will need to turn your clocks back Saturday night before you go to bed. You will also need to reset your board clock. Thanks Kath. Most people hate this time of year, because it gets darker earlier. Not me. I look forward to that extra hour of sleep every year. This works out for me this year! I got a house full of teenagers overnighting on Saturday, and I gotta make them breakfast, but I gotta be at church by 9 on Sunday to read the gospel, so this makes it all more leisurely for me to do both Sunday morning jobs. But I do hate the dark dark dark this time of year. aolver wrote: Have fun adjusting ladies. Yeah, us Arizonans don't have to worry about moving those clocks.